Increasing years mean changes in health, and the eyes are no exception. Seniors today are more active than prior generations during retirement. Since some vision problems associated with aging give few if any warning signs, senior eye care is more important than ever. You can depend on our friendly Plano staff for comprehensive vision care throughout your adult years. Age-related macular degeneration, or AMD, is the top reason for senior blindness. This disorder affects the central portion of your visual field but not peripheral vision. It diminishes your ability to see details and colors and sometimes causes distortion of straight lines. Treatments range from dietary supplements to medication or surgery, depending on whether you develop dry or wet AMD. 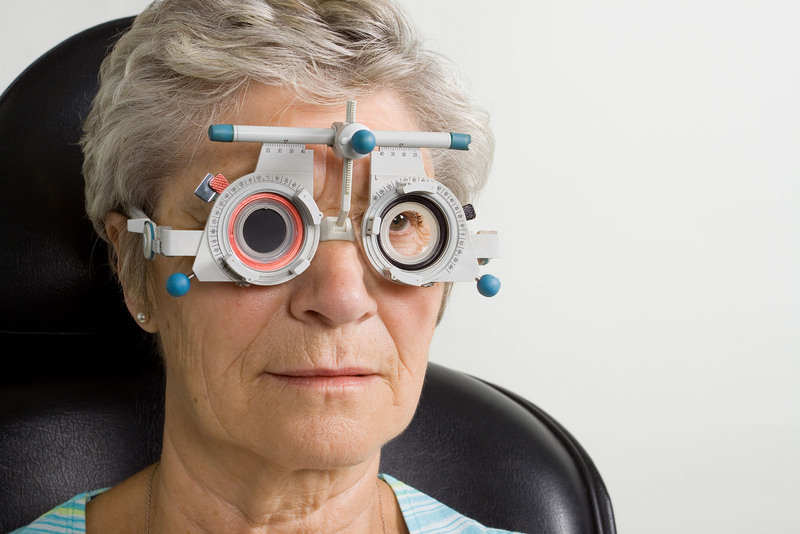 Cataracts affect more than half of American adults past 65. Clouding of the lens causes blurred vision. Updating eyewear can help postpone the need for surgery to remove cataracts. However, cataract removal is actually a low-risk outpatient procedure that can correct vision problems such as nearsightedness with ocular implants. Diabetic retinopathy sometimes affects a diabetic’s sight. This occurs when fluid seeps into an eye after damage to small vessels that feed blood to the retina. Alterations in diet, changes in exercise, and surgery are treatment options. Glaucoma can result in permanent blindness unless treated. It’s the result of excessive pressure within the eye. Unfortunately, diagnosis often occurs only when glaucoma is advanced. Early detection and treatment prevent loss of vision. Ocular hypertension sometimes precedes glaucoma. Around 10 percent of patients older than 40 develop elevated eye pressure. Outdated refractions can occur as vision typically worsens with advancing years. Regular eye exams help keep patients incorrect prescriptions. With increasing years, you could note some common everyday changes that require senior eye care. You might require more light to accomplish tasks or notice increased glare, difficulty distinguishing between colors, or lowered tear production. All are reasons for yearly Plano eye exams for seniors. Our optometrist always begins Plano eye exams for seniors by discussing your personal and family health history to identify issues such as diabetes, hypertension, eye diseases, or poor vision. The physical exam that follows includes a number of evaluations. Vision assessment: includes looking for nearsightedness, farsightedness, presbyopia, or astigmatism. Our doctor measures your vision and determines any prescription required to correct it. Eye muscle coordination: testing involves moving a light in a particular pattern. It evaluates the ability of your eyes to work together and how clearly and sharply you can see at far and close distances. Side vision: measurements utilize moving objects at the edge of your visual field. Pupil reactiveness: uses a shining light to determine how each pupil responds. Color tests: use colored dots and circles to evaluate your ability to distinguish between colors. Eyelid condition: determination involves examining each lid externally and internally. Eye interior evaluation: requires dilating your eyes with drops and using an instrument to look through your retina and your optic nerve to visualize the back of the eye. Fluid pressure measurement: is important for early glaucoma detection. An instrument releases a painless air puff into your eye. Amsler grids: have a checkerboard design. Our doctor sometimes provides them for home use to help spot any sudden visual changes linked to conditions such as AMD. To make sure you enjoy the best vision possible through the years, call us today at 972-964-3937 to schedule a comprehensive eye exam with one of our optometrists, Dr. Khoja or Dr. Patel. We offer a full range of vision and optometric services for adults and seniors in Plano, TX.